The National Security Inspectorate (NSI) and BAFE awarded the first ever Third Party Certificate of Approval and Registration to the new Kitchen Fire Protection Systems (SP206) Scheme at NSI’s annual Summit, Birmingham this month. The new scheme addresses the design, installation, commissioning, recharge and maintenance of kitchen fire protection systems (extinguishing/suppression systems). The scheme assesses the competency of kitchen fire protection system providers from the design stage through to periodic maintenance visits, evidenced by Certificates of Compliance. 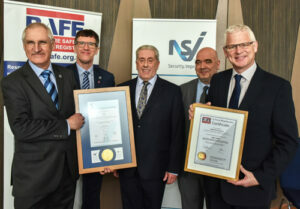 The first company to achieve this new Third Party Certification (offering Ansul R-102 systems) via NSI and BAFE Registration is Abbot Fire Group, based in Buckingham, strong advocates of Third Party Certification. Founder Nigel Walton was awarded their certificates by Jonathan O’Neill OBE, FPA Managing Director, during the opening session of the Summit. 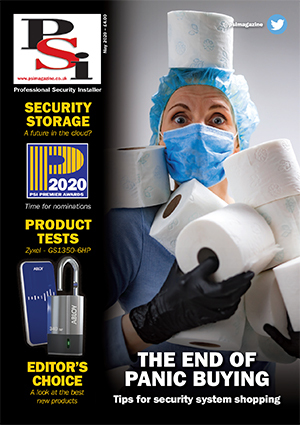 Nigel Walton commented: “Third party certification is continuing to be an important factor in the fire safety industry. We are grateful to BAFE for establishing this scheme which allows us to demonstrate our skill and expertise in providing our kitchen fire system offerings. I am immensely proud of my hard working and diligent team that all helped earn this certification. Certification was also awarded at the Summit to Nobel Fire Systems, who manufacture, design and install their own K-Series systems for Kitchen Fire Protection.